Rumours of a new version of the Vespa GTS have been circulating for a few months now, and Piaggio have finally released details of what fans can expect to find in the showrooms in the near future. Scootacaddy by Rhiando Products Ltd. Thanks to the scooter boom here in Great Britain during the late 1950s, a number of innovative people surfaced with products they thought us scooter riders would enjoy. Some of the most creative were courtesy of the Rhiando family who were big fans of the then new ‘fibreglass’ style material. Dad Spike Rhiando created a roofs scooter in the 1950s (long before BMW, Benelli or Adiva who all produced such scooters in the late 1990s) and tried to ride it from England to South Africa, abandoning his trip somewhere in the Sahara desert. His next venture was the Scootamobile for the Harper aircraft company of Exeter, the only known surviving example being displayed at the Haynes Motor Museum in Somerset. Meanwhile son Max (aka Buster) Rhiando was behind Rhiando Products Ltd of Guildford in Surrey who produced a range of accessories made of ‘Rhiteglass’, including this Scootacaddy from 1960, which was apparently tailor-made to fit to the front end of either a Vespa or Lambretta, pictured here attached to a Lambretta Series 1. The Scootacaddy could accommodate “helmet, gloves, coat or parcels”, was lockable and retailed at £13.17s.6d. Today such an accessory is as rare hen’s teeth, and for good reason we reckon! Arthur Francis S-Type 250 – from Watford to Milan and Glagow! As we’ve posted previously, 2014 is the 50th anniversary of the Arthur Francis (aka AF) S-type dealer special Lambretta scooters. 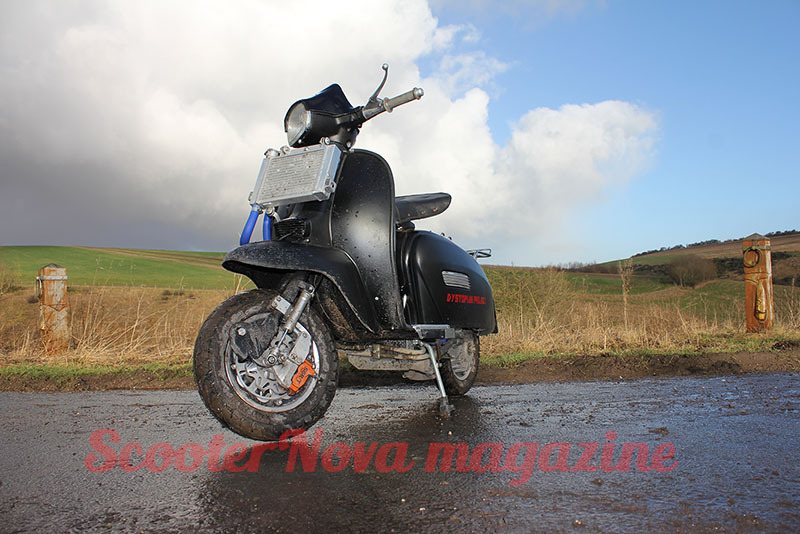 As a result of said posts published on Scooternova, Chris Wylde contacted us to tell us a little about the original 250cc S-type he bought back in 1967; a certain TJH 25D.